Creating an image for our clients is at the core of what we do at Neff Associates and sometimes there can be obstacles, but we are up to the challenge. We deliver expertise in marketing, social media, branding, media buying, and public relations for our clients, and our work in 2018 has already gotten us some new recognition in our industry. Clutch is a D.C.-based independent, third party reviewer of B2B companies around the world. The main way they conduct their research is through client phone interviews, which then become reviews on each company’s Clutch profile. 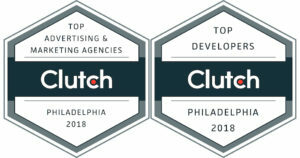 Neff Associates joined Clutch a few years ago and we’ve since grown our presence on their site as one of the top branding agencies in Philadelphia in 2018! We know that Clutch’s reviews are based solely on our clients, and that’s what makes us proud of our accomplishments. We dedicate a huge portion of the branding process to understanding the person behind the brand in order to create the right image for them. We have also been recognized on Clutch’s sister website, The Manifest, amongst the top 10+ branding companies in Philadelphia! With all these accomplishments under our belt, we will continue to create great results for our clients and work to become even better than we are now.